Congrats, you successfully made it down the aisle! You survived the wedding madness, but unfortunately you’ve still got one task left…and it’s a doozy: your wedding thank you cards. Before you flip out, remember that you couldn’t have made your wedding day quite as special without the help of loved ones. Your friends and family deserve some gratitude–all 250 of them. They didn’t complain when you asked them to be present for cake tastings and flower showings. They didn’t moan and groan (we hope) during the wedding set up and now it’s your turn to tell them just how much you appreciated their help during the whole process. 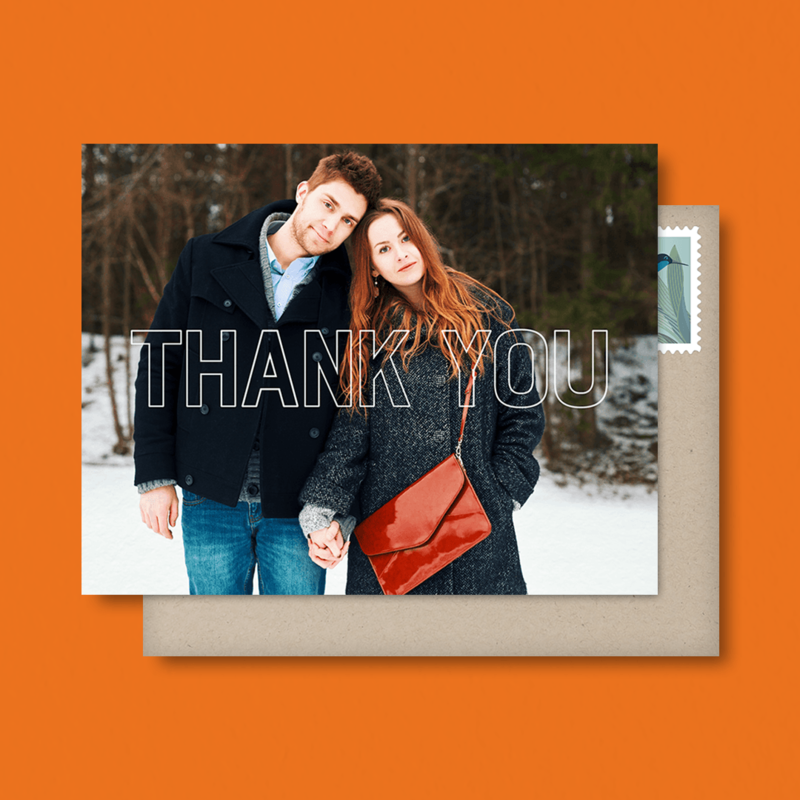 Writing your wedding thank you cards can be a huge task to get through, but luckily for you Postable has some nifty tricks to make writing them super easy. So stay calm and write your wedding thank you cards in minutes (yup, minutes). And in case you’d like a more in depth guide on how to write a thank you note, check out our Ultimate Guide. But before you get started, make sure to review these no-nos and avoid them with your wedding thank yous. You should be sending thank you cards to everyone who gave you an engagement, bridal shower or wedding gift. PLUS anyone who had an important role in your big day. This list should include everyone from your Bridal Party (c’mon, those girls put up with your crazy-ness for months, they deserve a little thanks! ), vendors (yeah, you paid them already, but sending that extra something their way will make their day a whole lot better AND make you look super duper sweet), family members who drove you to numerous cake tastings and dress fittings, and everyone else who showed up and threw some dough your way. To avoid missing someone and awkwardly running into them months later, write down names as the gifts roll in. Keep an ongoing spreadsheet or notepad where you write down the gift/gesture with each person’s name next to it. This way, when you sit down to write your thank yous, you can just cross the names off the list. This is also a good way to remember who got what so that you can mention it in your wedding thank yous. Check and double check that guest list to make sure every impossible-to-pronounce, is-that-even-a-name name gets spelled correctly. Also, don’t forget to include the name of your guests’ plus ones. If you aren’t sure of someone’s name or how it’s spelt, do some detective work and ask around. Chances are, someone else you know will have the inside scoop on spelling the name(s) correctly. Someone’s gotta be Facebook friends with them, right? Of course you should still thank someone for a wedding gift even though they couldn’t make it. You can even mention that you were sad to have missed them, but their gift is truly appreciated! Although it might seem oh-so-tempting to send out 300 of those e-cards with the animated cherubs, DON’T. 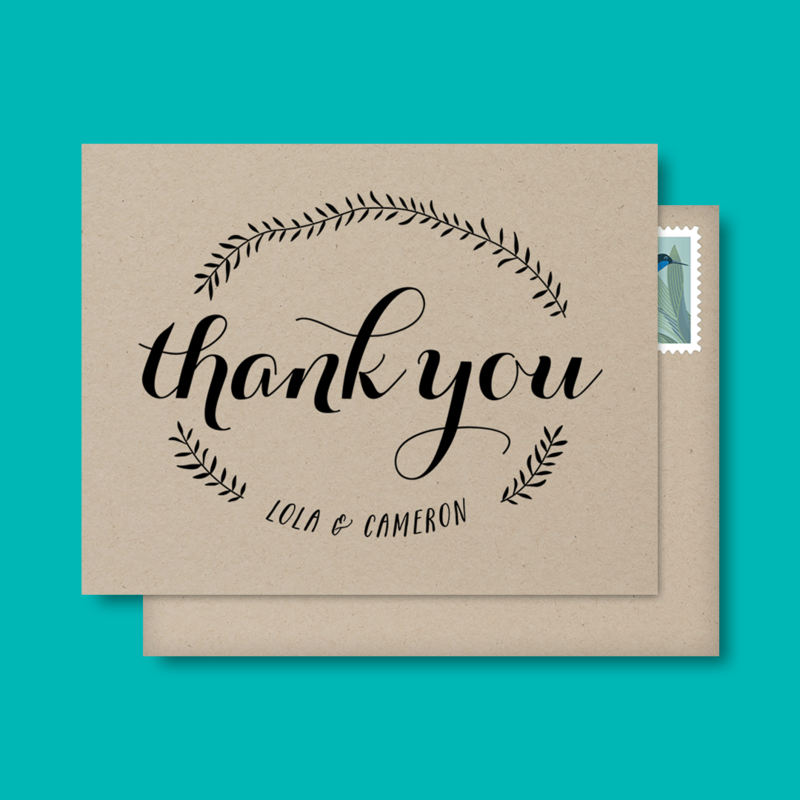 Post-wedding thank you notes are one of those occasions where snail mail is an absolute must. Does your 85 year-old grandmother who gave you the family china even know what e-mail is? C’mon, people get your head in the game. 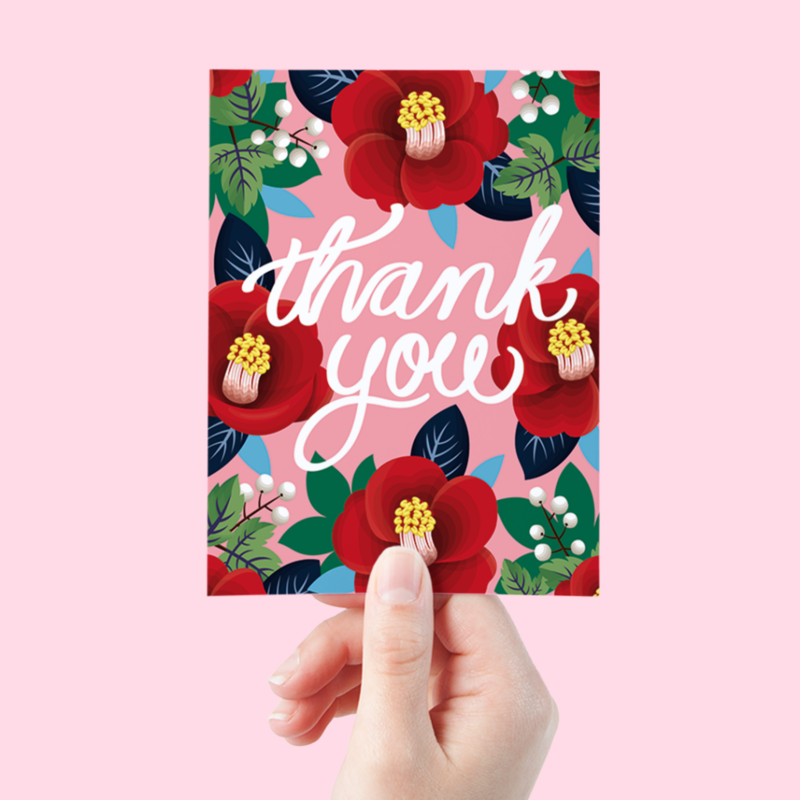 Get your wedding thank you cards ahead of time and have them ready to rumble when the gifts start rolling in — often times these come in before you walk down the aisle. You can also use Postable to easily write personal wedding thank you cards without leaving your couch. Here are some photo thank you cards where you can add your wedding or engagement photos. Once upon a time someone started a rumor saying that it was acceptable for couples to send out their thank you cards within a year of the wedding. This is a horrible lie that is making Emily Post roll over in her grave as we speak. You’ve got max 5 to 6 months to get those suckers in the mail. We get that you’re busy being newlyweds and all, but if your guests have forgotten what they gave you by the time your wedding thank yous arrive then you’re doing it wrong. To easily write all your wedding thank you cards, go to Postable.com. Checkout our Ultimate Guide on how to write a thank you note to get help on getting started with your wedding thank yous.